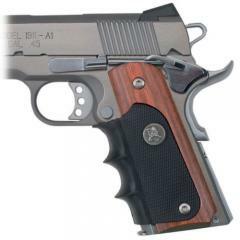 Improve shooting stamina and accuracy while retaining the gun's classically natural look with Pachmayr 1911 American Legend Grips from Lyman. The grip is constructed from a combination of wood and synthetic rubber to deliver an attractive finish that matches its tactical functionality. A walnut finish with a sleek, shiny varnish gives the handle a professional look, while rubberized finger grips improve overall control and gripping strength. The grooves are anatomically engineered to match the natural angle and position of a clenched fist to deliver a fuller grip with superior handling. The easy-to-install design only requires two screws for near effortless integration with firearms. Fit was perfect and has a better grip sensation in the palms.